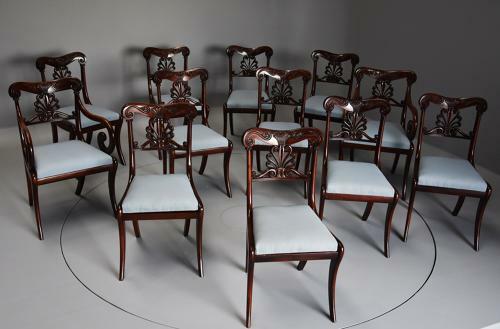 This set of chairs consists of ten single chairs and two armchairs, the shaped top rail being finely carved with stylised scallop decoration to the centre with carved scrolling and foliate designs to either side. This leads own to a finely carved and pierced anthemion design to the centre of the back support with scrolling carved decoration below supported on a moulded rail. The top of the side supports have a carved gadrooned collar leading down to shaped seat rails, the two armchairs having scrolling arm supports. This leads down to the drop in seats, having recently been re-upholstered in a pale blue fabric but this can easily be changed to a fabric of choice once purchased, the seat rails are shaped and lead down to sabre front legs with outswept legs to the back. This set of chairs are in excellent condition, are of stable construction and can go straight into a home - sets of chairs of this super quality and condition are seldom seen on the open market.